Monday I am taking my astrolabe and my ePamphlet on astrolabes to a local grammar school where I will talk to 4th-graders about astrolabes, explain to them how to use it, let them fiddle with one, and talk about science and scientific instruments. It should be fun. This is one way I think about public outreach, about bringing history of science to non-experts. These excursions—this is not the first time I’ve headed to a local grammar school—are, I suppose, what Lynn Nyhart calls thinking expansively about history of science, about becoming one of “them,” though I’d rather think this was something all historians of science did as a matter of course. 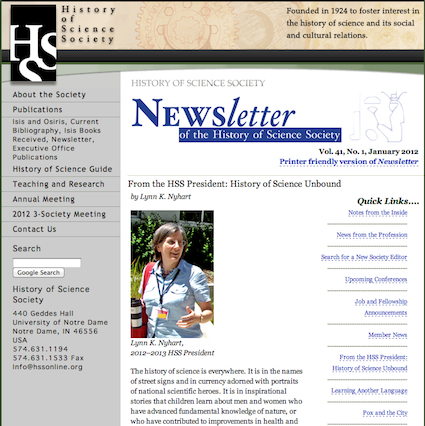 Lynn Nyhart calls on historians of science to think broadly about the profession. Yet we are the experts. We are the ones who understand and care most about the nuances of making scientific knowledge. We have studied science’s entanglements with nationalism and hero-worship and have analyzed the shaping of historical narratives that make certain outcomes seem inevitable. We have theorized about the moral ambiguities of science in a culture saturated with conflicting social and economic messages. We know this stuff. But we don’t own it. So what should the history of science, as a profession, do? Her advice is to consider history of science as a network of united by training [okay, I added “training”] and “our shared commitment to advancing our subject.” This would allow us to consider as meaningful both centers of graduate education as well as “other kinds of history of science-related institutions,” including museums, K-12 education, and policy development. She encourages us to reach a broader public through writing for that public and by translating scholarly work into forms accessible to that public. Nyhart echoes a discussion that has been taking place in the newsletters of the AHA, at Inside Higher Education, and blogs at The Chronicle for Higher Education. In No More Plan B Anthony Grafton and Jim Grossman wrote compellingly about how the history profession needs to redefine success to include careers outside R1 universities. They followed with Plan C, in which they called for graduate departments and faculty to embrace the legitimacy of multiple career paths, singling out public history. In his Historians at Work, Grafton concluded with a case study of a successful, early career historian working in public history, in this case in the Museum of the City of New York Together, these articles call on faculty and programs to stop denigrating non-R1 careers, to broaden the curricular offerings and graduate training to ensure students have the chance to acquire skills and confidence that will allow them to get jobs outside academia, show some of the real challenges historians have faced when trying to move beyond the walls of the academy, and indicate that success and rewarding careers do await historians who choose public history. These articles have elicited considerable response both praising the authors for drawing attention to the problem and criticizing them for not going far enough. See, for example, History and Politics of Scholarly Collaboration and ‘No More Plan B’. The point here is that Nyhart’s column joins a growing chorus of voices calling for some sort of reform, to enlarge the definition of successful to include “careers” without the qualifying “alternative.” More, however, needs to be done if we are going to transcend or reject the implicit professional hierarchy that divides the profession into us and them. It is too easy to map this division onto an “us” that works in centers of graduate education and produces original scholarship and a “them” that works in K-12 or in museums and translates that scholarship into forms accessible to a broader public. Only by taking Nyhart seriously can we begin to participate in and contribute to the public discourse about the history of science, the place of science in society, and science policy, or to write for that elusive, interested public.